NEWARK, N.J. -- A United Airlines passenger who tried to take her emotional support peacock with her on a cross-country flight had the bird turned away by the airline because of health and safety concerns. 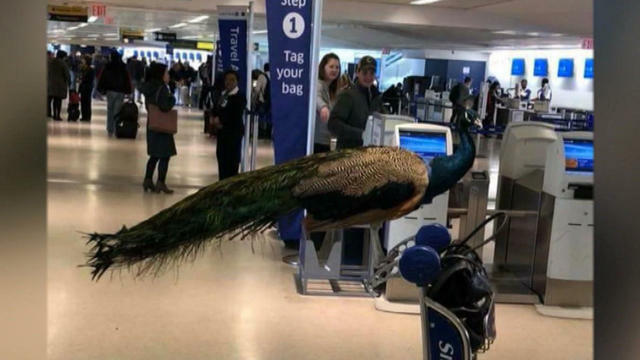 New York City-based photographer and performance artist Ventiko says she bought a ticket for her peacock, Dexter, so he would have his own seat on Sunday's flight from New Jersey's Newark Liberty International Airport to Los Angeles. A spokeswoman for Chicago-based United says the peacock didn't meet guidelines for several reasons, including its size and weight. Spokeswoman Andrea Hiller says the issues had been explained to the passenger three times "before they arrived at the airport." Dexter's Instagram account notes his "human friends" will be driving him cross-country.